The best coaches know that having great information is only half the battle. The challenge is how to get that information to TRANSFER into the athlete so it stays! And then of course, get the athlete to USE the information when it’s needed most. As former coaches ourselves, we’ve been really interested in refining the process so busy coaches (like you) can get what you need to be effective! So we enlisted the author of the #1 academic textbook within sport & exercise psychology to help us create an automated online course that does it. Then, we made it interesting to follow and easy to complete. The course is narrated throughout and is very visual (just how most of us prefer to learn!). You can jump in and out as you have pockets of time, and within a week or two, you’ll have the “Mental Coach Certification” completed. Intro to Mental Training: What it is and why could it mean the difference between good & great performances? Developing a Philosophy: Why it’s critical and how to develop an ideal one for you? Becoming a Great Communicator: You know every great coach does it, but what exactly do they do? Becoming a Great Leader: What are the fundamentals and how can you develop the most effective style? Mental Skill Sections: So you can integrate mental toughness skills into your practices, you’ll learn the most important ones (goal setting, motivation, visualization, arousal regulation, concentration and confidence). Mental Skills Implementation: How to assess mental toughness and then introduce the ideal mental skills for your athletes. 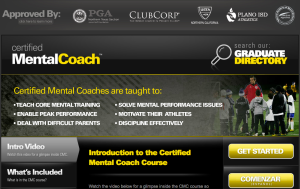 There’s nothing like this course anywhere in the world, and it’s available to you for US$295.00: Certified Mental Coach course!